After living amid the Syrian refugee crisis in Turkey for a year after graduating from the University of Toronto, Nouhaila Chelkhaoui knew she wanted to help make a positive impact on the lives of newcomers. Her return to Toronto gave her the opportunity to do just that, as she joined U of T startup iamsick's newest initiative, which helps refugees navigate Canada's complex healthcare system. After living amid the Syrian refugee crisis in Turkey for a year after graduating from the University of Toronto, Nouhaila Chelkhaoui knew she wanted to help make a positive impact on the lives of newcomers. Her return to Toronto gave her the opportunity to do just that, as she joined U of T startup iamsick's newest initiative, which helps refugees navigate Canada's complex healthcare system. iamsick is a digital health platform that focuses on providing people with access to healthcare services. Whether it's a doctor accepting new patients, a walk-in-clinic that's open late, a pharmacy, a diagnostic lab or nearby emergency room, iamsick shows users their nearest healthcare option anytime, Canada-wide. Their new refugee initiative aims to build onto their pre-existing platform by adding several features that focus on the needs of refugees. "We have identified many Arabic speaking healthcare professionals across Canada, plus Arabic is now one of five languages the platform itself has been translated into," said Chelkhaoui, now an account manager at iamsick. "We've also established a direct phone line for assistance in English, Arabic and French for two hours a week so refugees who don't have access to the internet or aren't tech savvy can still get the information they need." Chelkhaoui, a former international student in the department of political science, says she has always been passionate about human rights. After spending a year working in Turkey and being exposed directly to the Syrian refugee crisis there, she has been especially driven to make a positive change. "Compared to Turkey, Canada has been incredibly receptive to Syrian refugees, offering an overwhelming amount of support," said Chelkhaoui. "We recognize the diligent efforts by the community to support newcomers, unfortunately many of these efforts remain uncoordinated and ineffective." To address this, in addition to building new features to help newcomers, iamsick has been working closely with a number of local partners to maximize their impact by sharing resources and information on multiple levels - from government to grassroots organizations. "A main component of iamsick's refugee initiative is its partners," said Ryan Doherty, co-founder of iamsick. "Our partners not only make us stronger and help us spread the word, but they offer feedback and suggestions as experts in refugee settlement work." WelcomeHomeTO, an initiative spearheaded by U of T alumna Derakhshan Qurban-Ali together with a team of engaged citizens, is among the partners collaborating with iamsick. "Working with WelcomeHomeTO has been meaningful for me particularly," said Chelkhaoui. "Derakhshan comes from a family who were Afghan refugees, and myself being an international student from Morocco, I believe this kind of partnership represents the student body from a newcomer background and we hope it serves to inspire and empower students from all backgrounds to go after their dreams to make an impact." iamsick is also working with Toronto Local Immigration Partnerships (LIPs), regional umbrella offices for immigration efforts and organizations that are helping newcomers settle. 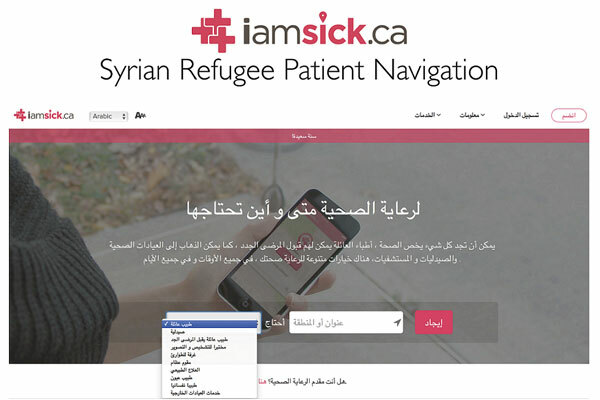 Through discussions with partners such as WelcomeHomeTO, and LIPs as well as the refugees themselves, iamsick also plans on expanding its search filters to include gender, mental health services, community health centres and even Interim Federal Health Program providers for those who are not covered by Ontario's health insurance program. "The important thing to think about is continuation," explained Doherty. "There's a strong focus on supporting refugees when they arrive, but after a number of months they will be settling into their new homes and may begin to experience challenges navigating their new environment. 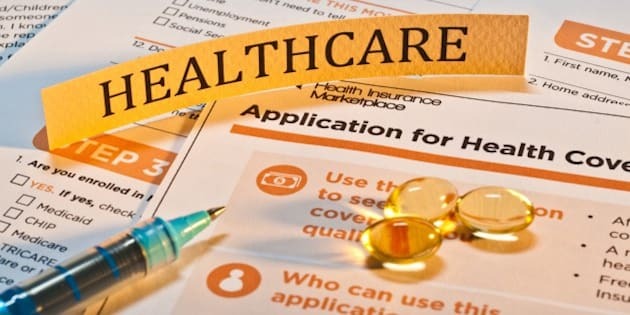 Having a website and app like this, which focuses on language barriers and showing what's available, is extremely useful to them as it is to any Canadian trying to navigate our complex healthcare system." While the initiative was inspired by the newly arriving Syrian refugees, iamsick has identified healthcare professionals across Canada who speak more than 80 languages, in a bid to make the platform friendly to refugees, newcomers and Canadians alike.